Now there is a cool shark wave attack t-shirt. 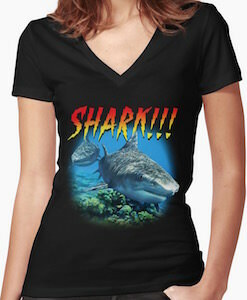 The shark t-shirt is available in styles for both men and women and is available in many colors and in sizes Small – 5XL. 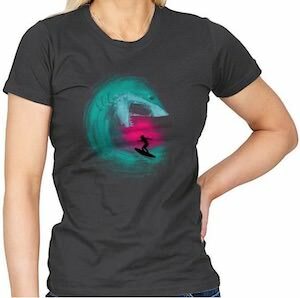 On the shirt you can see a surfer ridding a big wave and that a wave seems to be transforming into a shark that is ready to eat the surfer. Besides the surfing fighting the wave there is some nice light behind the wave so that it looks even cooler. Now you can have a t-shirt that makes you want to get to the beach every time you wear it. If you like to attract sharks then you have to get this shark bait t-shirt. This fun shark t-shirt is available in styles for men, women, and kids and comes in many sizes, styles, and colors. 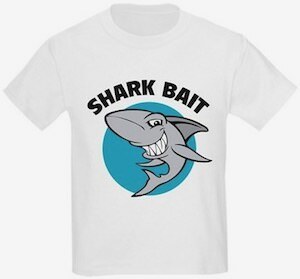 On the shirt you can see a blue circle and on the circle you can find a shark that is showing his white teeth to you and then above the shark it says in big letters “Shark Bait”. 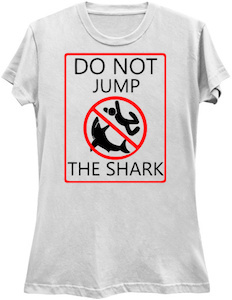 A fun shirt like this is great for visiting the ocean but maybe people will stay away from you because sharks could be coming really close to you as you are the bait. 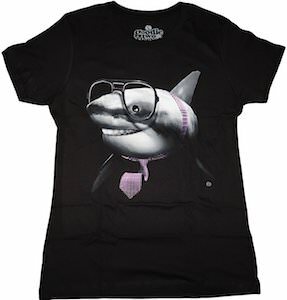 If you want the world to know that you like sharks then you should check out this crazy shark lady t-shirt. The t-shirt is available in many styles, colors, and sizes to make it the perfect t-shirt for you. 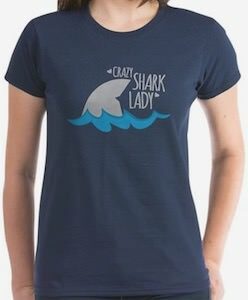 On the shirt you can see the waves in the sea and a shark fin sticking out of the water and then around the shark fin it shows the text “Crazy Shark Lady”. So if you are a woman that like a fun shark t-shirt for any day of the year and especially for Shark Week then have a look at this shirt. Lives of all creatures on this planet matter and if you like sharks then this is the t-shirt for you as it is a shark lives matter t-shirt. The t-shirt is available in many styles for men, women, and kids and it comes in many sizes, and colors to make it just perfect for you. The shirt shows a big shark that looks a lot like a great white shark only this one is blue and below the blue shark it says in big letters “Shark Lives Matter”. 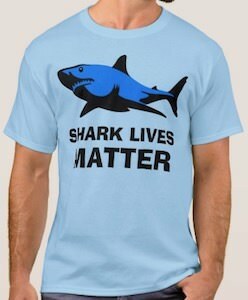 Time to tell the world that it is time to save the sharks by wearing this amazing t-shirt. 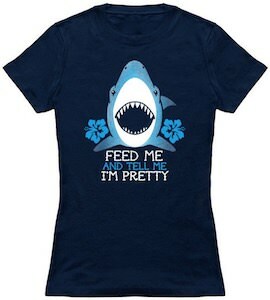 If you want the perfect shark t-shirt then you need this t-shirt. The t-shirt is available in a bunch of colors and it is a unisex shirt so perfect for both men and women and it is made from 100% cotton and it comes in sizes Small – 3XL. 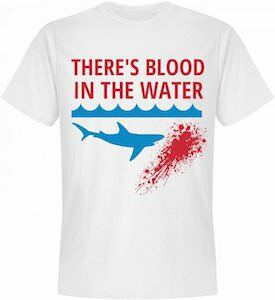 On the shirt, you can see blue waves and below it, you can see a blue shark swimming in the direction of blood and above the water, it says in red “There’s Blood In The Water”. So by wearing this t-shirt, people know you are ready for shark week or any other day you like to think about those amazing shark. If you really like Shark Week then you just need this unisex t-shirt to show the world. 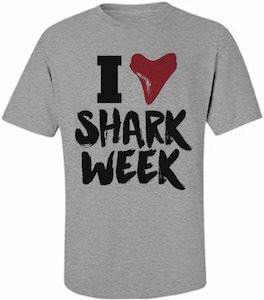 The t-shirt just says “I Love Shark Week” in a fun font and the word love is actually a heart or is it….. No, it’s not a heart it is a shark’s tooth making it really cool and special. So now just wearing this t-shirt shows the world that you will be watching sharks on TV when Shark Week returns. You can get this t-shirt in light gray, white, light blue, and pink and it comes in sizes Small – 6XL and because it is a unisex t-shirt both men and women can enjoy wearing it.